Let’s say you’re a novice to sailing and you’re curious to give it a try. Where do you start? 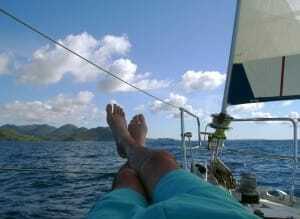 How can you get a taste of the sailing lifestyle, and what are you getting yourself into? Here’s a secret: You don’t have to buy a boat. You don’t need grand plans to sail around the world. You definitely don’t need to spend a lot of money. All you need is a little time and the willingness to give it a shot. Luckily, getting new sailors started is one of ASA’s specialties. You can ease your way in without even leaving the home, plunge straight into an exotic sailing adventure, or try something in-between. Whatever your style, here are five ways you can begin to live the dream. It only takes about 30-45 minutes, and covers all the basics for a new sailor or anyone looking to brush up. You’ll learn sailing terms, the parts of the boat, basic safety skills, and even what to wear and bring with you. This is great preparation for a first sailing lesson, and will also make you a better guest aboard someone else’s boat. Try it for free here. 2. Attend an On-Water Clinic at a boat show. ASA exhibits at boat shows around the country, and now offers a variety of on-water clinics so you can go sailing at the show! There are courses for all levels, from first-timers to seasoned cruisers. 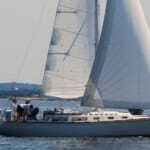 You’ll learn sailing skills straight out of the ASA curriculum, taught by our certified instructors. Check with your local boat show to see if we’ll be there! Many of our sailing schools host “Open House” events periodically where you can get to know the instructors and the boats, and sometimes even go sailing for free. It’s an easy, low-stakes way to see what sailing is all about. Find your nearest ASA sailing school and contact them to see if there are any open house events scheduled. 4. 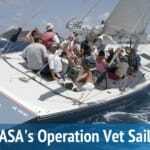 Take an introductory ASA sailing course. This is where the REAL learning begins. 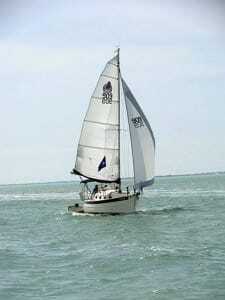 Sign up for ASA 101, Basic Keelboat Sailing, and get ready to become a confident small boat skipper. You’ll learn everything you need to have a great time as a casual sailor, and have the option of continuing through our courses to become an expert. Once again, just contact your local sailing school to get started! 5. Join an ASA Flotilla. This is for those who want to start their sailing lives with a bang! ASA flotillas take place all over the world each year. Some of our favorite repeat destinations include the Caribbean, the San Juan Islands, Greece, Croatia, and Tahiti. And you don’t have to be a hardened sailor to go! Each boat will have a qualified skipper on board, and the trip will be led by an ASA instructor who is an expert in the local waters. Check out our flotilla schedule for 2013 here!